Photograph courtesy of Erik Voss, copyright 2018 Erik Voss. (APN) ATLANTA — Over the last few years of the leadership of Stephanie Stuckey (formerly Stephanie Stuckey Benfield), the City of Atlanta has made numerous strides towards sustainability. The former State Representative joined the then-Mayor Kasim Reed Administration in 2015 as Director of the Office of Sustainability. In 2016, the City of Atlanta created an Office of Resilience, and Stuckey was promoted to head that office. Earlier this year, Stuckey submitted her resignation to Mayor Keisha Lance Bottoms, per Bottoms’s request that she made to all department heads. During her three years at City Hall, Stuckey and her team of fourteen city employees began an urban forest program, where fruit trees will be planted on public lands for free public consumption; the City adopted the strongest Electric Vehicle Charger programs in the U.S.; the City began implementing its recycling bin requirements for multi-family housing; and the City increased the use of solar panels on city properties. In 2016, the City became part of the 100 Resilient Cities (100RC) network. This network was pioneered by the Rockefeller Foundation to help cities around the world build resilience to the economic, social, and physical challenges of the 21st century. Sustainability is a key part of this challenge. The Office of Sustainability was founded in 2008 under Mayor Shirley Franklin. Its original focus was on energy efficiency; but has expanded to include waste recycling, water conservation, solar, electric vehicles, and urban agriculture. Sustainability strives to put the world into long-term balance amidst the depletion of natural resources. Over two years ago, the City, with a grant from the U.S. Department of Agriculture in partnership with the Conservation Fund, purchased 7.1 acres off of Browns Mill Road in southeast Atlanta to start an urban food forest. This is the largest urban food forest in the country located in an area identified as a food desert. Mario Cambardella, the Urban Agricultural Director; and Elizabeth Beak, his assistant, led the effort to get funds and start the project with extensive community input and agreement on the plan, although a couple residents recently complained to a City Council Committee that they were not consulted regarding the project. Educational programs at the urban forest teach local residents and students how to grow food. This is part of the City of Atlanta’s goal to bring healthy food within a half mile of 75 percent of Atlanta residents by 2020. A few of the students trained in urban farming have gotten jobs in this field. Some of the features of the urban forest are nut and fruit trees; community garden plots; a mushroom walk; sensitive medicinal plants in native soils; a vegetable and flower garden; a native and non-native food forest grove; and protections for existing black walnut, pine, and water oak trees. On June 16, 2018, the public can come out and learn about the 27 new fruit trees planted at the Browns Mill Food Forest, and can help weed and clean the orchard area. This is only the tip of the iceberg, and not just iceberg lettuce. The City now has a fleet of 63 electric vehicles (EV) with six charging stations in city parking areas for city-owned and operated vehicles. The EV were purchased in bulk to take advantage of a federal tax credit. In addition, per the suggestion of the Office of Sustainability, the City Council in 2017 adopted 17-O-1654, containing requirements that all new buildings accommodate electric vehicles. The ordinance requires that twenty percent of the spaces in all new commercial and multi-family parking structures to provide EV charging stations. It also requires that all new development of residential homes be equipped with the infrastructure needed to install EV charging stations. The EV legislation was opposed by the Atlanta Apartment Association, but passed City Council and is now the strongest EV law in the U.S.
APN raised concerns about dependence on electricity in a state like Georgia, where the proportion of electricity coming from renewable sources remains low, and Georgians continue to rely on electricity sources like coal and nuclear. “If you look at the overall life cycle of EV (electric vehicles) versus fuel combustion engines that are dependent upon foreign oil… the carbon footprint is reduced with EV,” Stuckey told Atlanta Progressive News. Also, Georgia’s energy mix is slowly and steadily moving in the right direction, as APN has covered. Per another legislative accomplishment by the City of Atlanta, the City has established a goal to transition to one hundred percent clean energy sources for municipal operations by 2025, and for the entire city by 2035. The Office of Resilience has installed 200 EV charging stations at the Hartsfield-Jackson Atlanta International Airport and established a low-income EV Rideshare pilot program. Atlanta’s city code states that a residential building with six units or more has to provide recycling bins and recycling collection for its tenants, but until recently, that code was never enforced. “When I came on as Sustainability Director that is one of the first things I worked on because that ordinance had been passed in 2008, but was never enforced. We worked hard at making owners aware of the law and that they were in compliance,” Stuckey said. When the Office first mailed out postcards informing apartment owners about the 2008 law, hundreds of postcards came back in the mail because the City does not have an up-to-date list of multi-family property owners and their contact information. After learning that no city department had such a database, the Office of Sustainability began working on its own database and has been calling multi-family property owners by phone to discuss the recycling requirements. For years, many Atlantans have incorrectly believed that the City only required recycling for single-family homes. With more people moving to Atlanta every day and thousands of new apartments and condos going up, it is critical that multi-family property owners do their part to prevent recycling materials from entering our landfills. Now approximately fifty percent of multi-family apartment buildings are in compliance with the ordinance, with some 250 multi-family facilities signed up for recycling. The City’s goal is ninety percent waste diversion by 2020; and with recycling on the rise, that goal is achievable. The Solar Atlanta Program led by the Office of Resilience is installing solar panels on 25 municipal buildings – mainly fire stations and recreations centers through a public-private partnership with Cherry Street Energy and Radiance Solar. The City currently has one building completed with solar panels, and 24 other municipal buildings will be complete by the end of 2018. “It took three years to get to this point… now we are solarizing a new facility every other week,” Stuckey told APN. Atlanta has an abundance of sunlight, but the solar market faces challenges in Georgia due to a variety of reasons, mostly because of lack of incentives for renewable energy. “The only way we can do rooftop solar installation and make it financially viable is if we target buildings where we are paying high utility rates, and that’s how we arrived at the 25 buildings,” Stuckey said. Atlanta Progressive News pushed the issue of solar panels on city buildings several years ago, in 2012; and then-City Utilities Committee Chairwoman Natalyn Archibong (District 5) inquired about implementing such a policy. At the time, the City’s Office of Sustainability, under a director prior to Stuckey, opposed the idea, saying that solar panels were too expensive at the time. The City said they were hoping that the price of solar would decrease in future years, which it has. Now that solar prices are coming down, more people are turning to solar for the long haul. These amazing programs will continue and expand under the leadership of the Interim Chief Resilience Officer Cicely Garrett; Sustainability Director John Seydel; and Mayor Keisha Lance Bottoms. Mayor Bottoms has initiated a Youth Sustainability Ambassador Program where 10th and 12th grade students can learn energy and water conservation, building weatherization, solar panel installation, urban agriculture, and much more. The classes are taking place on June 07 through June 28, 2018. APN will continue report on the progress of these exciting Sustainability and Resilience Programs. UPDATE 1 and CORRECTION: A previous version of this story listed Mario Cameron as the Urban Agriculture Director. In fact, the Urban Agriculture Director’s name is Mario Cambardella. The article has been updated to reflect the correct name. UPDATE 2 and CORRECTION: A previous version of this story stated that the City’s clean energy goal is to have one hundred percent clean energy citywide by 2023; the correct year is 2035. The article has been updated to reflect the correct date. 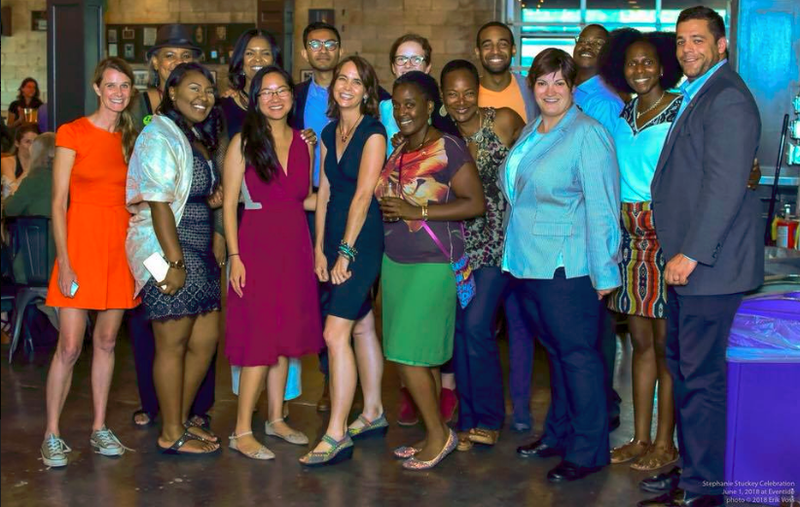 …..and yes, Stephanie’s achievements were incredible in advancing sustainability in Atlanta. One of the key reasons is that she assembled a great team of intelligent and passionate people. Yes we have made the correction, thank you. We are emboldened by the solar planning. We hope that the solar cells will be put together by US workers with safety as well as good pay. Search your favorite engine for these key words. By strengthening a solar refund tax we can help towns in middlega. as well as West Virginia and Kentucky that provide nuclear and coal for our electricity. The solar tax credit will help city of Atlanta neighborhoods. People might install on private property helping in town neighborhoods and helping small solar businesses that design, manufacture or install products from US companies. Nice diverse group of people. Looks like a Benetton advertisement. What happens to solar power when the weather is cloudy, overcast with or without precipitation of any sort ?….